British welterweight Amir Khan’s fight against Samuel Vargas is set September 8 yet, but this early, he’s made a warning to Filipino Manny Pacquiao and others who will come his way next. The 31-year-old Khan (32-4, 20 KOs) announced he plans for another knockout victory against Vargas in his renewed campaign to move closer to another major fight versus, possibly, Pacquiao, in a fight Khan has been craving for years. Also being considered, according to ESPN senior writer Dan Rafael, is long-time British rival Kell Brook, with whom he shares promoter Eddie Hearn of Matchroom Boxing. 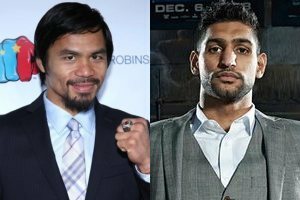 The 39-year-old Pacquiao, following his seventh round TKO triumph over then Argentine WBA welterweight king Lucas Matthysse last month, is also considering Khan, a former stablemate at Freddie Roach’s Wild Card Boxing Gym, as one of his top priorities for his next outing. Khan is a heavy favorite to disposed off Vargas (29-3-2, 14 KOs), 29, a Colombia native fighting out of Toronto, in their scheduled confrontation at the Arena Birmingham in Birmingham, England. Vargas had just been knocked out in his two fights against top opponents in Danny Garcia in seven rounds and Errol Spence Jr. in four rounds. He also is coming off a 10-round draw with little-known Mauro Godoy in June. Khan, who is on the comeback trail following a harrowing sixth-round knockout loss while challenging then-middleweight world champion Canelo Alvarez in May 2016, is training with Joe Goossen in Southern California in preparation for his fight with Vargas. He made his return to the ring following a 23-month layoff on April 21, in what amounted as cameo appearance, as the former unified junior welterweight world titleholder needed just one right hand, a quick flurry and 39 seconds to drill Phil Lo Greco. “It's one of them fights I have to be very smart in. I need to win and also look good doing so. There's big fights in the pipeline, but I can't afford to look that far ahead; Vargas has my full attention," he told Rafael. "Vargas is a tough and well-schooled fighter, but if he wants to fight on the inside, I'll be more than ready for it," Khan said. "He has shared the ring with some top welterweights, including Danny Garcia and Errol Spence Jr. We're going to be prepared for whatever he brings. I'm a totally different fighter now to the old Amir Khan." When Khan made his return in April, he trained with Goossen because trainer Virgil Hunter was ill and unavailable to work with him for the fight. Although Hunter is back on his feet, Khan elected to remain with Goossen. "Camp has been very hard. It's so hot out here, so making weight is not a problem. But training in this temperature is difficult. We spar 10 to 12 rounds with 30-second breaks, with high-intensity training around it -- so come fight night, I'll be more than ready."